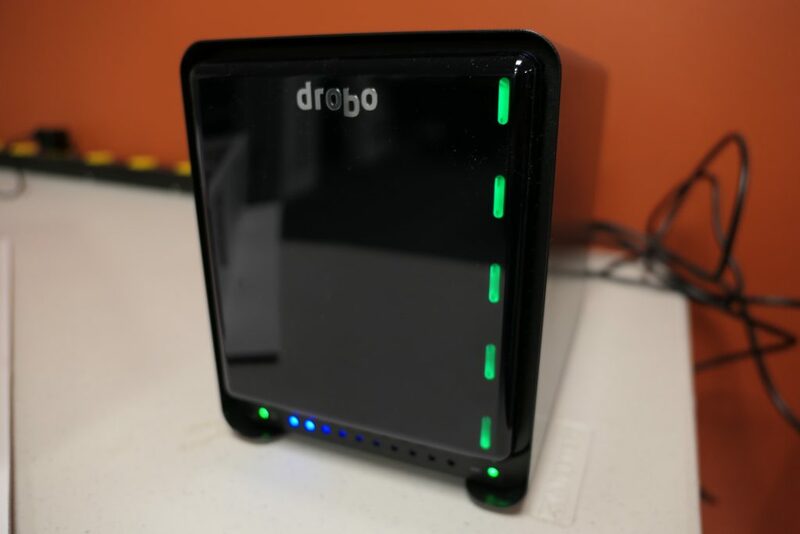 The Drobo 5N2 is Drobo’s third iteration on a NAS device. If you look at their previous efforts in the field, the Drobo FS and Drobo 5N, you might not notice any external difference at all. Really since the initial Drobo devices in 2007, the company has stayed with their playful minimalist toaster design. Ten years in and it seems to have aged well. From a spec sheet perspective, the 5N2 seems pretty well rounded. It has five drive bays and can support up to 2 disk failures without data loss. There are two big features added in the 5N2 from its predecessor. One is a more powerful processor. Drobo beefed up their NAS game, now offering a quad-core Marvell ARM processor. The knock on Drobo’s has historically been speed, and this seems to do a decent job of improving the situation (with some notable exceptions, see below). The other big difference is the addition of a second Ethernet port (the 2 in 5N2). This can be used for either bonded Ethernet, or an active-passive setup. We unboxed the Drobo at Gestalt IT a little while back. Drobo takes great pains to present their products as consumer accessible, and it shows in both the unboxing and setup process. By far the smartest decision Drobo made in their design process was to make setup completely toolless. Coming from a PC building background, where fiddling with small screws in tight spots is par for the course, it was a refreshing change. 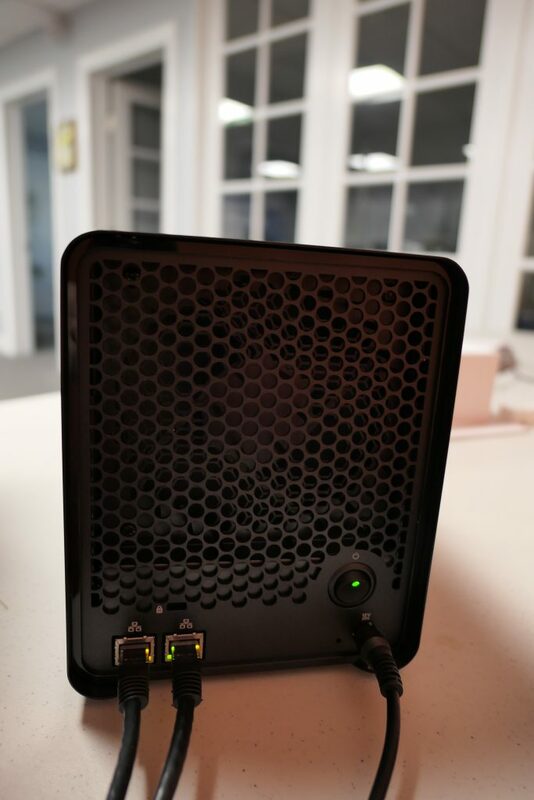 The entire front panel of the Drobo is held on magnetically, on firmly enough to stay on while moving the device, but easily removed by hand. It still freaks me out to have any kind of magnet by mechanical hard drives, but after swapping out several in testing, I’m reasonably assured it’s fine. Adding drives simply requires sliding them into the bays. There are no guide rails on this, so it can feel a little harrowing to just jam a drive in there, but realistically it’s dead simple. For removal, there’s a small spring inside that will push the drive out when you push aside the gray securing clip. If I had to gripe, the plastic doors on the drive bays feel a little flimsy, but realistically most users hopefully won’t be swapping drives all that much make it an issue. Once the drives are inserted, plug in Ethernet and power and you’re ready to get started. With the device all powered up, you’ll need to download the Drobo Dashboard software. This is available for Windows and macOS, but curiously doesn’t have any Linux support. This wouldn’t be an issue if you could just manage it directly through a web interface, but sadly Drobo deigns that to be too technical for their audience. While the Drobo hardware design has aged well, their software seems to be a little more dated. The UI feels like its straight out of Android 3.0, with a weird cyber-honeycomb background. Luckily the dated UI largely doesn’t impact functionality. Initially, the dashboard should detect the 5N2 on your network. From there, you’ll setup the initial admin account, and probably install a firmware update. Once you’ve setup the admin account, the Drobo is good to go. You can probably get the entire device from in the box to usable in well under an hour. In the Dashboard, you’ll spend most of your time on three main screens: Status, Capacity, and Shares. Status, unsurprisingly, gives you an overview of system performance and capability. You’ll notice on our screenshot we have a health warning. At the time it was taken, we were transferring from one to two disk redundancy. This meant that during that backup, the data on the drives was not protected, and the system lets you know. More generally, this screen will show you if the Drobo detects a failing disk or network issues. The benefit of having this as an installed app vs a web interface is you’ll also get a system notification on your machine when those warnings crop up. The Capacity screen does what you’d think, show you what you’re using and how much storage space is available. While there’s not much actionable that can be done here, its definitely a screen you’ll keep an eye on for capacity planning and data management. Shares lets you setup specific access for users. By default, Drobo just setups up a Public account. You can give users specific access to different shares, as well as setting absolute size limits for each share. While not the most comprehensive set of controls I’ve seen in a NAS, it allows new Admins to quickly see who has access to what, and get off the ground quickly. Because everything has apps, Drobo has a little app store. This is really the only indication that Drobo is running any type of Linux on their box. Anyone who’s used a Linux system will recognize some of the available offerings. In an age when the Apple App Store has millions of apps, and we almost expect to be inundated with a plethora of software, the limited selection on the Drobo can seem underwhelming. This isn’t to say there isn’t useful software here. Drobo does a good job of covering the bases, but compared to competitors like QNAP, it’s noticeable. Drobo has their own set of apps for photo backup and remote access, with companion smartphone apps. There’s also a few media servers (notably Plex), the Transmission BitTorrent client and a few file sync options. On the business side, there’s an available mail client (for sadists who want to roll their own mail server), and WordPress installs. Linux users will be happy to see options like Bash, Midnight Commander, Git, and Nano (yes I know Emacs/Vim is better). The available apps might not be comprehensive, but there’s enough there for most of the home and small business needs you’ll have. Drobo might not have the implementation you were expecting, but the functionality is at least there. Plus if you’re really ambitious, the box can run Python, Ruby, Node.js, and Perl for development purposes. The main problem with the apps is management. It’s just clunky. Once you click on an app and install it in their awkward folder layout, it then kicks you out to a separate window with a completely different UI that includes instructions on how to configure the app. These are basically just HTML pages hosted on the Drobo, but they end up being slow, and clunky. Not a fan of the implementation. Once the apps are up and running though, the experience is much better. The Drobo 5N2. Each drive bay has an easy to see Green/Yellow/Red LED to indicate status at a glance. At the bottom, a row of blue lights give a quick relative view of overall device capacity. With the magnetic cover off, a glance at the exposed drive bays. The back of the 5N2 has a minimum of connectivity. Dual Ethernet ports are one of the big upgrades from the Drobo 5N. 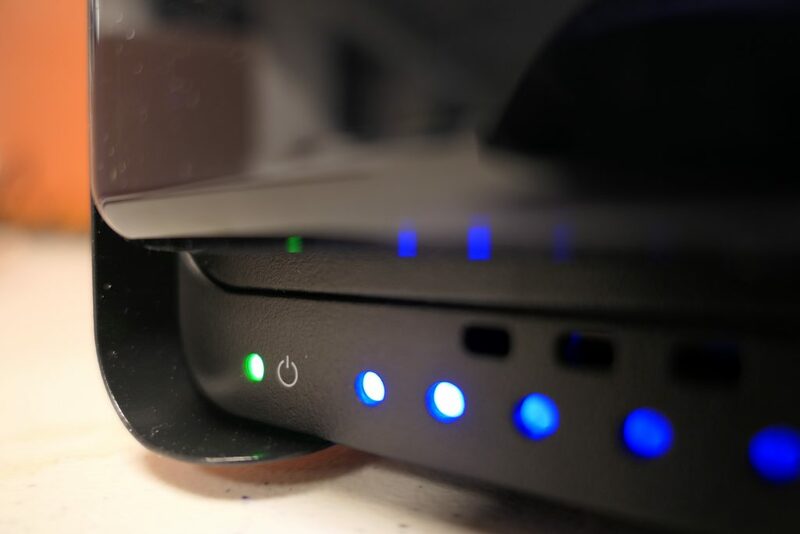 The Drobo 5N2 shows yellow lights as it rebuilds from a new drive. It’s no secret that Drobo has a history for being a little on the low end of performance. The good news is that the Drobo 5N2 is a much better performer than it’s 5N sibling. When using it on a local network, aside from some latency when first accessing the share, it feels very similar to working off of a flash drive. I decided not to test out the Drobo to try and get maximum ideal performance. If I did, I would have used SSDs in each bay and equipped the optional mSATA drive for tiering acceleration. But that’s not how I see a lot of small businesses or home users using this. Most will use either available drives around the office, or maybe spring for a few mid-capacity WD Red drives to fill out the bays. So that’s what we did, mixing capacities and drive speeds across the NAS. For large file downloads, we did real world testing moving large Linux ISOs and Final Cut Pro libraries across the network. These transferred reasonably well at around 93MB/second. For small file downloads, we did a mix of photos and documents, totaling a little over 2GB in various batches. These proved much more challenging than the larger files, topping out at 35MB/second. Running Black Magic’s Disk Speed Test yielded similar results to our real world large file transfers. We saw 95MB/second writes and 97MB/second reads. This puts the 5N2’s performance in the “eminently usable” category. I was able to edit HD video directly off Final Cut Libraries on the device with no noticeable lag or stutters (export speed did seem to suffer). In fact the only issue using Final Cut was one time the Drobo simply dropped off the network for a minute, and Final Cut freaked out. I ended up not losing any data, but it did disrupt my workflow. However that was the only drop-off I experienced in testing, and might well have been a local network issue. Of course, having a NAS with decent performance and features isn’t very useful if it does a terrible job at protecting data. And if it takes forever to recover, it’s almost more of a pain than it’s worth. Luckily, the Drobo 5N2 does pretty well on the data protection front. For starters, the 5N2 supports two disk redundancy, meaning you can lose up to two disks without data loss. Keep in mind though that the default is one disk redundancy. I can understand why, Drobo doesn’t want someone’s first experience when plugging in 20TB of raw storage to only see 12TB available. And for a small business or home user, one-disk protection is probably adequate. But for the paranoid or for people that can’t afford even a brief period of unprotected data while a disk rebuilds, two disk redundancy is a nice option. Drobo doesn’t achieve this protection using a typical RAID 5 or 6 setup. Instead they use a virtualized RAID they call BeyondRAID. Adding this layer of data management to their system has several benefits. The most important is that it allows for both mixed disk sizes in a NAS, as well as easy expandability to larger capacity drives. Basically you’re not limited to the size of your smallest disk, and you can just swap out a drive when you need more storage. Drobo’s BeyondRAID has been around for a while. On a feature level, it includes a lot of sophisticated data integrity components. The knock on it has always been that it’s slow. I was warned when I got the Drobo 5N2 for review that swapping out a drive would take days to rebuilt. Well after testing, I’ve found it to be vastly improved on this unit. Swapping out an old 500GB drive for a slightly less old 750GB drive took a little over an hour to rebuild. Switch over from one to two disk redundancy took a little longer, about 5.5 hours. Simply removing a drive to simulate a failure is more variable. When taking out a 1TB drive, it took about two and a half hours to redistribute data for redundancy protection. Removing a 2TB disk took almost four hours. For the SMB and home user market this product is aimed at, I think that’s acceptable performance. Drobo also offers integrated off-site disaster recovery protection, albeit with not a lot of versatility. They offer DroboDR, which essentially allows you to replicate to a Drobo at a different site. The implementation is pretty straight forward, one Drobo has to be target, the other the source. 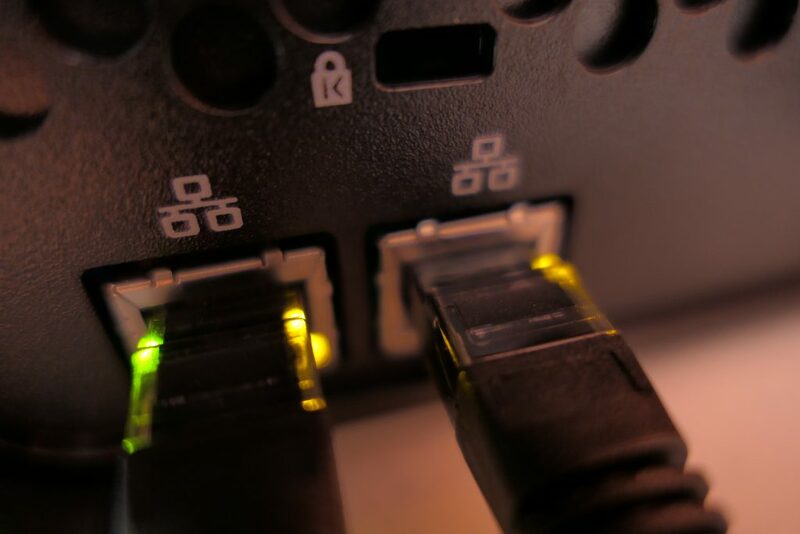 If you can setup VPNs on both sides, it should be easy to get it up and running. This data protection does double your hardware investment, and your target Drobo is in read-only mode for obvious reasons. It’s easy to by cynical that Drobo only included the feature to sell another NAS unit, it’s still a vital feature for true 3-2-1 data protection. The other option is backing up to a cloud target. Sadly, this isn’t supported in the Drobo app store to make it a little easier (there is an app for ElephantDrive cloud backup, but you’re locked into one cloud vendor, boo). It’s not a total deal breaker since you can just use a third-party backup client to target your network share, but I wish it just worked out of the box. I tested out cloud backup using a combination of CloudBerry Backup and Backblaze B2 cloud storage. I’ll be honest, it’s far from a seamless experience. For one, CloudBerry isn’t free, costing $29.99 after a free trial. For that cost, there’s one key limitation, you’re limited to a single network share for backup, no matter how many backup plans you schedule. It’s weak sauce. This isn’t Drobo’s problem, but without having a similar offering out of the box (one that isn’t tied to a specific cloud storage provider), users are just kind of left on their own. On a positive note, the B2 storage performed reasonably well on the single network share. Backblaze has expected controls in place in terms of bucket sizes, bandwidth limits, with helpful notification settings to make sure your NAS isn’t racking up an unexpectedly high bill. Cloud support is where Drobo seems behind some of their competitors. Synology’s Cloud Sync integrates across public clouds and more typical file sync services like Dropbox, with granular controls build in. Drobo customers are largely left to their own devices. 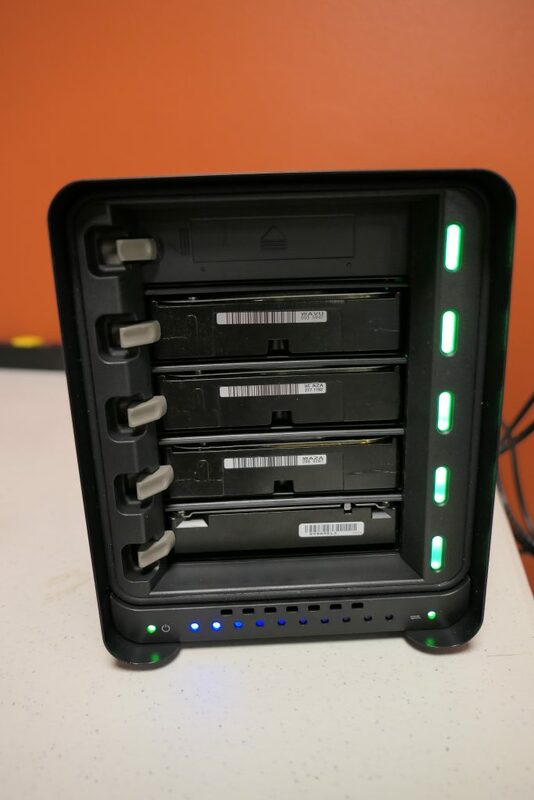 We also tested the Drobo 5N2’s chops as a media server. This included looking at the Drobo’s capabilities as a simple DLNA local streamer and a more full-featured Plex install. The former test was surprisingly unsuccessful. After installing the MiniDLNA app from the App Store, I couldn’t bring up the configuration panel. Even after reinstalling and rebooting, no such luck. Plex was more successful, but also a mixed bag. If this is your first NAS or media server, I’m assuming your media collection is a selection of downloaded movies in various formats. Maybe some are iTunes downloads and others are DVD rips. This presents a problem when using the Drobo 5N2. Plex doesn’t natively play all video formats, but can transcode almost anything into a usable H.264 file. The problem is the Marvell CPU on the Drobo isn’t cut out for transcoding. Forget about doing it on the fly, creating optimized media for Plex was chugging along at 0.3x speed. Once optimized media was created, it plays back fine at 1080p across the network. With a little planning, the CPU isn’t that big of an issue. You can have Plex create optimized media overnight for a few titles, and over time you’ll have access to your entire collection. Knowing that Plex prefers H.264 (I had a ton of ripped MKV files for testing), you can change your behavior going forward. But it made for a disappointing experience initially. The Drobot 5N2 is a NAS for people that don’t know they want a NAS, but need one. If you have an IT staff in your office, odds are a Drobo will not offer all the options you’re used to in a NAS. Then again, Drobo goes to great efforts to emphasize that this isn’t it’s target market. 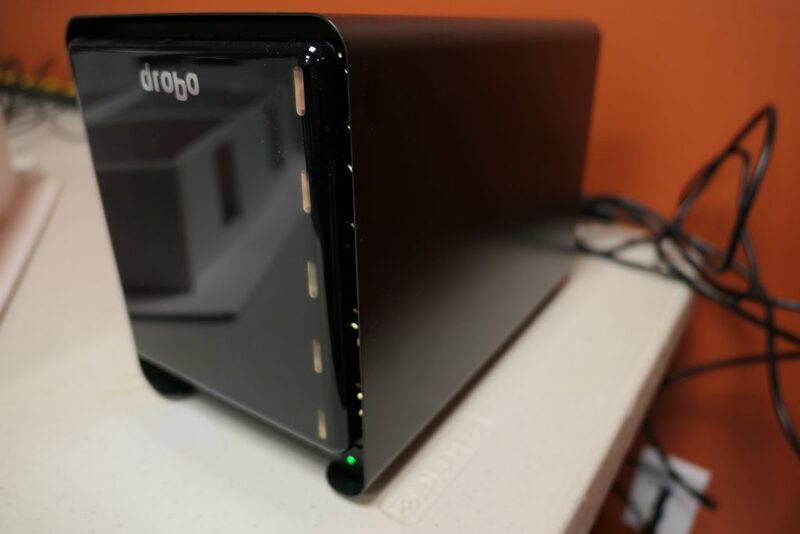 Drobo in general, and the 5N2 in particular, is designed for either SMBs with no IT staff, or a home user looking to easily roll out shared storage. If you look at their data sheets and the product itself, Drobo tries to make the hardware itself beside the point. Most of their competitors like QNAP and Synology proudly point to how much memory they offer, their specific RAID support, embedded Linux distributions, and CPU power. After some extensive searching, I can’t find that anywhere from Drobo. That’s because they’re positioning this NAS more as a backup appliance, something that you plugin, setup once and forget about mostly. Drobo mostly delivers on this appliance-like promise. In many ways, they’re much like a video game console versus a more powerful gaming PC. To be clear, you can build a FreeNAS box that will blow the Drobo 5N2 out of the water. But you won’t have nearly a compact a package, you’ll pay for the priviledge, and you’re on the hook for setup and support. If you want a complete NAS package that’s easy to setup, and let’s you get down to data protection and sharing files on your network with a minimum of fuss, the Drobo 5N2 is a much better choice.